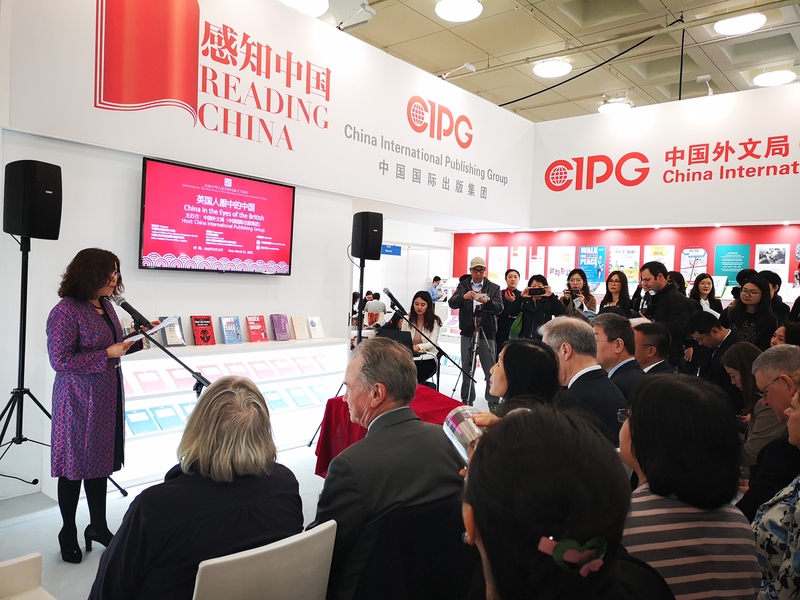 In the morning of March 12, on the first day of the London Book Fair 2019, the China International Publishing Group (CIPG) held a celebration of the 70th anniversary of the founding of New China and the 65th anniversary of the establishment of diplomatic relations between China and the UK at the level of chargés d'affaires. The theme was “China through British eyes”. Mr Ma Hui, Minister of the Chinese Embassy in the UK, Mr Liu Dawei, Vice-President of China International Publishing Group (CIPG), Mr YU Peng, Minister Counsellor of the Chinese Embassy in the UK, Ms XUE Ling, Director of the London Office of the Ministry of Culture and Tourism, Lord David Wilson and Lady Natasha Wilson, Lord Michael Bates and Lady Xuelin Li Bates, and Professor Martin Albrow, Fellow of the British Academy of Social Sciences, attended the event. The new book launch and donation of books event was hosted by the CIPG, supported by the Cultural Office of the Chinese Embassy in the UK, the London office of the Ministry of Culture and Tourism of China, organised by New World Press and the Global China Institute and its Global China Press. The event was chaired by Ms. Huang Wei, Director of the Editor-in-chief’s office of the CIPG. 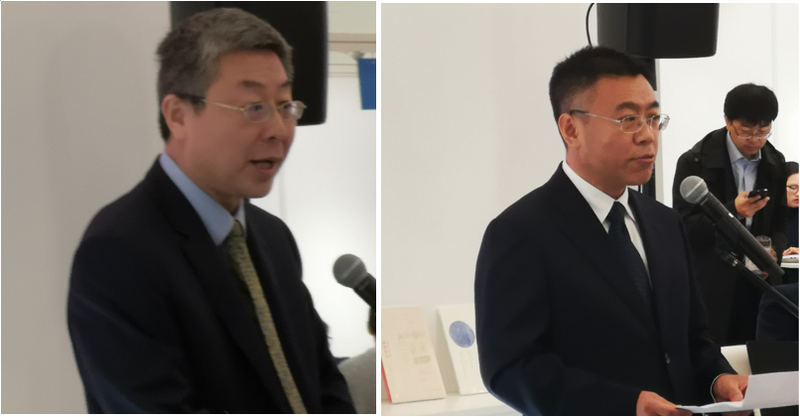 Mr MA Hui, Minister of the Chinese Embassy in the UK and Mr Liu Dawei, Deputy Director of the CIPG, delivered speeches. Minister Ma Hui said that this year is the 70th anniversary of the founding of New China and the 65th anniversary of the formal establishment of diplomatic relations between China and the UK at the level of chargés d'affaires. 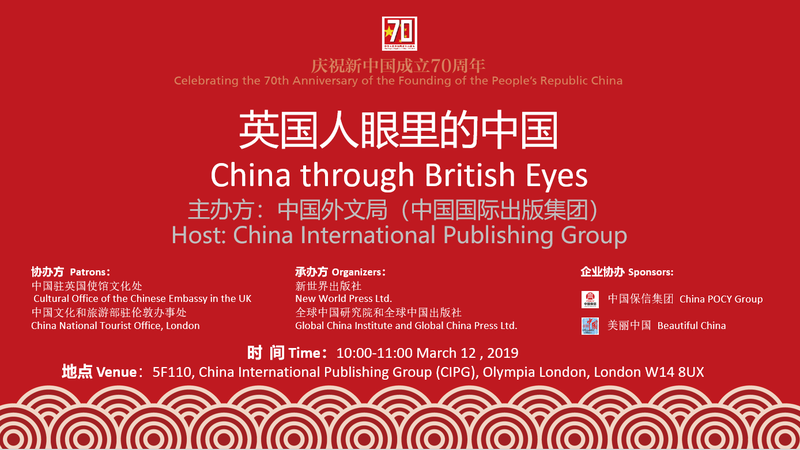 At such an important moment, the meaning of using this opportunity at the 2019 London International Book Fair with the theme of “China in the eyes of the British" is profound. 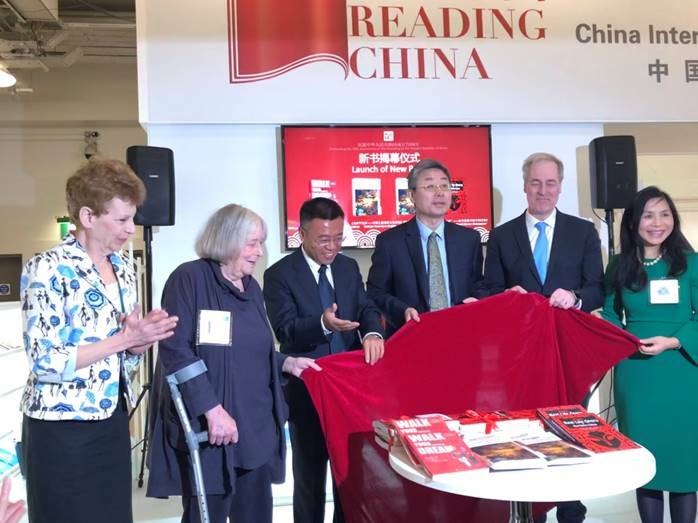 Vice-President Liu Dawei said that this “Sino-British interactive” themed book exhibition was showcasing more than 100 books published by the Chinese Foreign Languages Bureau over the past 70 years, which are read by people in China and the UK in the interests of mutual understanding. These books are the historical witnesses and cultural symbols of the humanistic exchanges between the two countries. They also reflect the profound friendship of “similarity and connection between people's hearts” between the Chinese and British people. 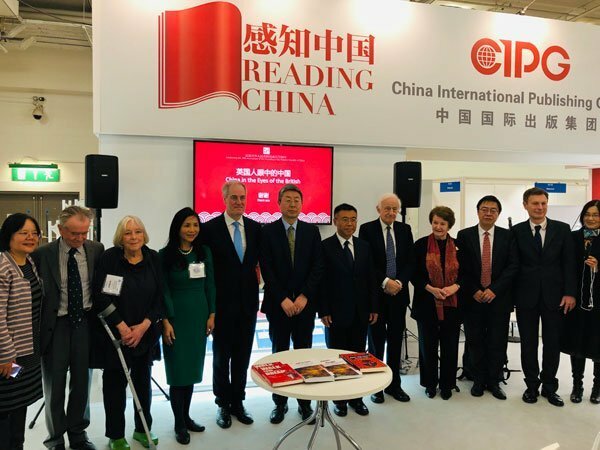 Subsequently, Mr. TONG Meng, Director of the Copyright Department of New World Press, and Professor Chang Xiangqun, Editor-in-chief of Global China Press, introduced the two publishers and their collaboration in publishing in the past five years. Mr Tong Meng said that the cooperation between New World Press and Global China Press began in 2014. In the blink of an eye, five years have passed. The scene at which the first signing for strategic collaboration took place is still vivid in his mind. The collaboration has been full of challenges and difficulties. Owing to the different environments we are in, we have had different views on many issues during the period. However, when we see the books successfully co-published, coming into the public domain and receiving high praise, both parties think that all our efforts have been worthwhile. He said he believes that future cooperation between us will be better and better! 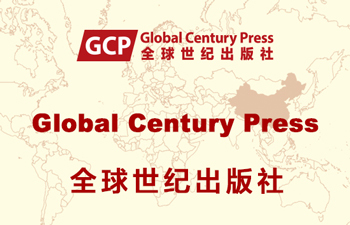 Professor Xiangqun Chang said that, although Global China Press was only founded five years ago, as a specialist publisher, it has developed a number of unique characteristics. It is the first publisher in the world to focus on bilingual publications of studies of China in comparative perspective, Chinese perspectives of the world or human knowledge, and non-Chinese perspectives of China in a global context. GCP is particularly focused on comparing and contrasting the Chinese and the non-Chinese. For example, we published an updated edition of a book on pingju by John Chinnery as Pingju: Real Life Opera and a ‘Rural Chinese Shakespeare¸ inviting attention to the comparison between the Chinese and the Western ‘Shakespeares’. Similarly, there are some similarities between Lord Bates and Fei Xiaotong, the pioneering Chinese sociologist and anthropologist. Fei’s work had a great influence on China’s social economic development, and Bates’s book provides some useful thoughts and information for understanding China from a comparative perspective. 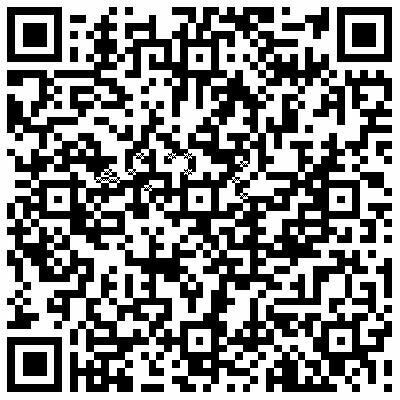 We hope that our publications promote a deeper and more comprehensive understanding of China and Chinese people in the global context, and at the same time provoke thought, study and action, adding to the sum of human knowledge and promoting a more harmonious and peaceful human community. Lord Bates, Professor Martin Albrow and Dr France Wood gave excellent speeches on the theme “China through British Eyes” from the perspectives of Chinese society, politics, thought and culture, based on the books they had written or to which they had contributed a foreword. Lord Bates asked what the anecdotes in his books tell us about modern China: two things, he said, which may seem paradoxical. On the surface life, continues unchanged outside the metropolis and yet, at the same time, underneath it is changing all the time (e.g. steel works are closing, villages are getting clean water and people are receiving pensions) because of decisions taken in the metropolis. On the surface, other countries and cultures are seeking to become more fiercely independent and yet underneath we are becoming more and more interconnected and interdependent. The more time we spend talking to real people about their lives, the less of a problem diversity and difference become. Professor Martin Albrow said that China now, with its Belt and Road Initiative, is for the first time in its history taking its unique national experience into a wider world far beyond its traditional boundaries. This venture is complementary to, and draws upon some of the features of economic globalization and its institutional structures. But its main difference from the Western-inspired models of governance is that it looks to shared goals rather than the imposition of rules. In other words, although the success of China’s opening-up depends on the adaptation and assimilation of both Marxism and Western economic and social science into its own cultural traditions, it does not approach other cultures from a standpoint of superior virtue or knowledge, but in the spirit of finding common goals and shared projects. Dr Frances Wood said that John Chinnery was interested in pingju, the modern transformation of a popular cultural form of opera. One of his most lovable characteristics was his sense of humour and he enjoyed the combination of scandal and local themes in pingju – with stories sometimes reflecting items in the popular press. His book introduces an original and modern genre which reflects local concerns, developing a traditional format for the 20th century. It also reflects John Chinnery’s compassion for suffering artistes and his enjoyment of humorous themes and dialogue by the pingju writer Cheng Zhaocai, the “Chinese village Shakespeare”. Launching Walk Your Dream (English edition) and Pingju: Real Life Opera of Northern China (English edition) published by New World Press, as well as Walk for Peace: Transcultural Experiences in China (enlarged English edition) and Pingju: Real Life Opera and a ‘Rural Chinese Shakespeare’ (updated English edition), published jointly by New World Press and Global China Press. Then the CIPG held a book donation ceremony, Lord and Lady Bates, Dr Wood presented the above four books to Cambridge University and the University of Westminster, received by Charles Aylmer, Head Librarian at the University and Professor Hugo de Burgh, Director of the China Media Centre respectively. Mr Liu Dawei, Vice-President of CIPG, presenting the new books published by New World Press and Global China Press to Lord and Lady Wilson. Finally, he presenting multilingual China-themed books to Mr YU Peng, Minister Counsellor of the Chinese Embassy in the UK. Some guests at the book donation ceremony. 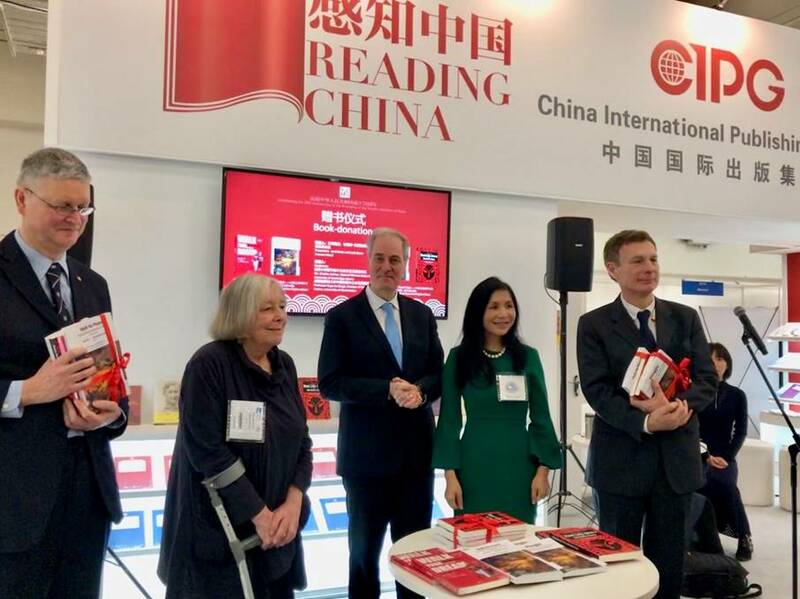 The "Sino-British interactive themed book" exhibition was the first themed book exhibition, representing many views and mutual appreciation among people from all walks of life in China and the West, at the London International Book Fair since its inception. 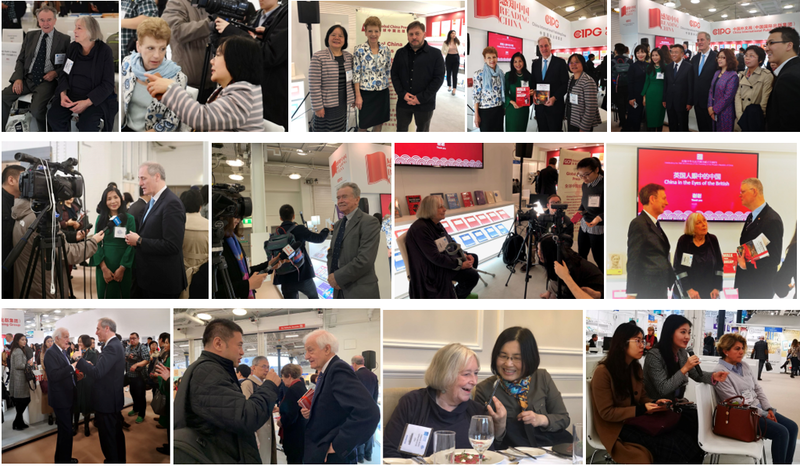 The event attracted several prominent figures from political, academic, cultural and publishing circles of China and the UK, promoting exchanges and understanding between the Chinese and the British. It was a highlight of the London Book Fair.